Do not start working until exhaust system and engine coolant is cool enough. Use either 2-pole lift type or separate type lift as best you can. 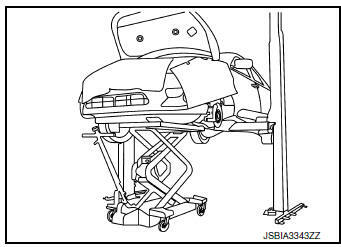 If board-on type is used for unavoidable reasons, support at the rear axle jacking point with a transmission jack or similar tool before starting work, in preparation for the backward shift of center of gravity. For supporting points for lifting and jacking point at rear axle, refer to GI-29, "Garage Jack and Safety Stand and 2-Pole Lift". Remove hood assembly. Refer to DLK-233, "HOOD ASSEMBLY : Removal and Installation". Relieve fuel system pressure. Refer to EC-144, "Work Procedure". Remove fender protector. Refer to EXT-28, "FENDER PROTECTOR : Removal and Installation". Remove battery tray. Refer to PG-76, "Removal and Installation (Battery Tray)". Remove air cleaner and air duct. Refer to EM-24, "Removal and Installation". 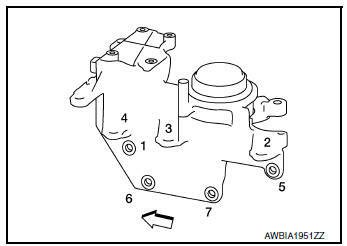 Remove relay box assembly from underhood. 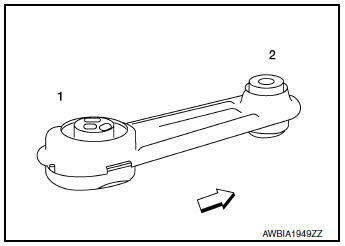 Remove radiator hose (upper/lower). Refer to CO-13, "Exploded View". 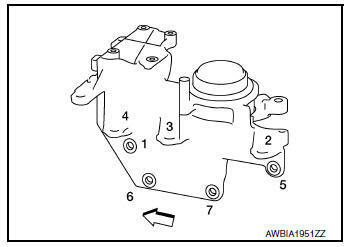 Disconnect heater hose inlet from engine side. 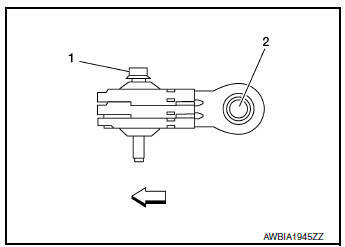 Disconnect heater hose outlet from engine side. Disconnect control cable. Refer to TM-197, "Removal and Installation". Remove EVAP and vacuum hose from intake manifold. Remove quick connector cap from fuel hose and fuel tube. Disconnect harness connector from fuse box. Disconnect harness connector from IPDM E/R. Disconnect harness connector from refrigerant pressure sensor. Remove low-pressure pipe. Refer to HA-32, "LOW-PRESSURE PIPE : Removal and Installation". Remove high-pressure pipe. Refer to HA-34, "HIGH-PRESSURE PIPE : Removal and Installation". Remove steering knuckles (LH/RH). Refer to FSU-9, "Exploded View". Remove front drive shaft (LH/RH). Refer to FAX-18, "Removal and Installation (LH)" and FAX-20, "Removal and Installation (RH)". Remove front suspension member. Refer to FSU-20, "Removal and Installation". Remove CVT fluid cooler hoses from radiator. Refer to CO-13, "Exploded View". Disconnect battery negative cable ground bolt from transaxle. Remove upper torque rod (RH). 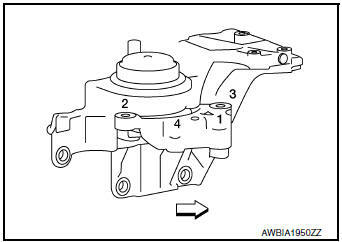 Remove engine mounting bracket (RH). 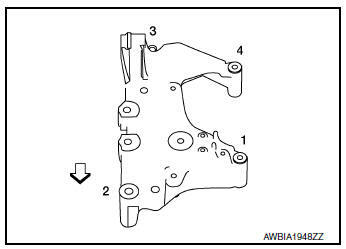 Install engine slingers into front left of engine mount bracket (RH) and rear right of cylinder head. Support weight of engine and transaxle assembly with a shop crane. Use a suitable jack and securely support bottom of the engine and the transaxle assembly. CAUTION: Put a piece of wood or an equivalent as the supporting surface, secure a completely stable condition. Slowly lower engine and transaxle assembly. As engine and transaxle assembly is being lowered ensure there is no interference with body or engine harness connectors. Before and during this procedure, always check if any harnesses are left connected. Avoid any damage to, or any oil/grease smearing or spills onto the engine mounting insulators. Disconnect harness connector from input speed sensor. Refer to TM-207, "Removal and Installation". Disconnect harness connector from output speed sensor. Refer to TM-209, "Removal and Installation". Disconnect harness connector from primary speed sensor. Refer to TM-208, "Removal and Installation". Remove PNP switch from transaxle assembly. Remove harness connector from transaxle assembly. Remove starter motor. Refer to STR-21, "Removal and Installation". Remove drive plate inspection cover from engine. Hold drive plate with suitable tool and remove torque converter nuts. Remove transaxle to engine mount bolts. Tighten the transmission bolts to specification. Refer to TM-220, "Exploded View". Do not allow oil to get on mounting insulators. Be careful not to damage mounting insulators. 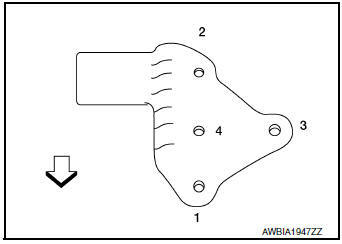 Tighten the bolts in sequence as shown to the specified torque. 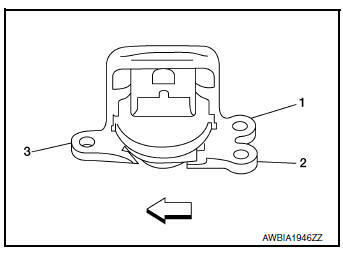 Install the engine mounting bracket (RH). 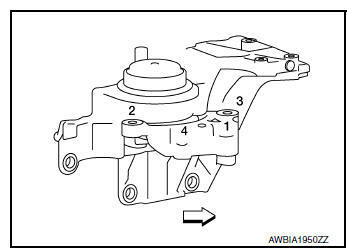 Remove front drive shaft (LH/RH). Refer to FAX-18, "Removal and Installation (LH)" and FAX-52, "Removal and Installation (RH)". Remove transfer assembly. Refer to DLN-70, "Removal and Installation". Before starting engine, check oil/fluid levels including engine coolant and engine oil. If less than required quantity, fill to the specified level. Refer to MA-11, "Fluids and Lubricants" (United States and Canada). Use procedure below to check for fuel leaks. Turn ignition switch ON (with engine stopped). 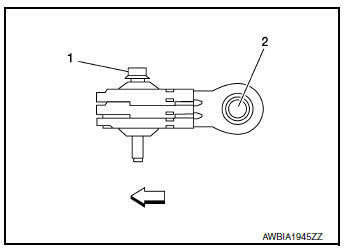 With fuel pressure applied to fuel piping, check for fuel leaks at connection points. Start engine. With engine speed increased, check again for fuel leaks at connection points. 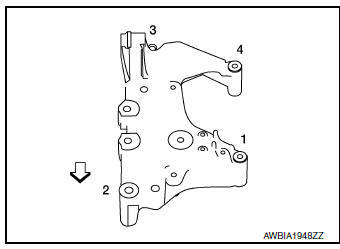 NOTE: If hydraulic pressure inside timing chain tensioner drops after removal and installation, slack in the guide may generate a pounding noise during and just after engine start. However, this is normal. Noise will stop after hydraulic pressure rises. Warm up engine thoroughly to make sure there are no leaks of fuel, exhaust gas, or any oils/fluids including engine oil and engine coolant.